Reproduced here is a commentary by Bob Teoh that appeared in the MalaysianInsider.com and MySinChew.com May 2. Links have been inserted to provide background. Stung by the incendiary anti-Christian campaign in the run-up to Polling Day, Bumiputera churches in Sabah and Sarawak are hitting back with unprecedented vigour. A “pastoral communiqué” on the “Allah” issue has been hammered out to be circulated today, just two days before polling, to all city and interior churches. A copy of the communiqué was obtained by MySinchew today. The move is unprecedented in its unusually hard-hitting language which is uncharacteristic of Bumiputera pastors and church leaders who traditionally maintain a cordial relationship with the government. “We, the native Christians of Sabah and Sarawak, have kept silent for a considerable length of time. Some have taken our silence to mean something else. Therefore, the time has now come for us to speak,” the communiqué said in its opening line. “Surely the way forward is no longer found in the status quo which expects the Bumiputera Church in Sabah and Sarawak to remain silent,” it added. 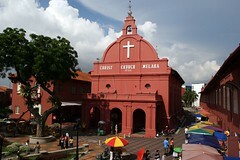 “Two-thirds of the Church in Malaysia is made up of Bumiputera Christians in Sabah and Sarawak. In this respect, we speak with pastoral and moral responsibility and authority against religious bigotry, racism and extremism in any form. But we are not alone as our non-Bumiputera brothers and sisters in Christ have also expressed similar concern over the ‘Allah’ issue on other occasions. We, therefore, speak as one voice,” the communiqué said. Meanwhile, their non-Bumiputera counterparts in the peninsula issued an equally hard-hitting statement yesterday. The Christian Federation of Malaysia (CFM), the umbrella Christian body, issued a strongly-worded statement at what they call a “despicable and heinous” anti-Christian message on election campaign boards and demanded the Election Commission act swiftly to douse the sparks of such religious fear-mongering from catching fire once more. “These fears are real given the recent history of Church burnings and threats to burn the Bible in Bahasa Malaysia,” said Rev Eu Hong Seng, chairman of CFM, and its executive committee. “A manifestation of such extremism is the extent to which fringe groups within our midst would go to advance their racism and religious bigotry over the controversy of the use of the word ‘Allah’ to refer to God by non-Muslims. They have even suggested an open season for burning Bibles (pesta membakar Alkitab). Nothing can be more seditious and incendiary. Yet they were tolerated by the authorities,” it added. It argued that the “Allah” controversy is not really about religion as such but about unreasonable government policies and laws. “In the face of such unreasonableness we cannot and should not remain silent. The time for us to speak has come,” it said. It was also careful to point out that “indeed, in speaking we are mindful to extend love to those who may not agree with us. The essence of God is love (1 John 4:8). Thus we are compelled to love even our enemies (Matthew 5:44)”. The outrage has been simmering for a while but it was at the recent biennial general meeting in Kuching of the Association of Sarawak Churches, the umbrella Christian body in the state, that its chairman, Rev Datuk Bolly Lapok, the Anglican Archbishop of Sarawak as well as the newly appointed Archbishop of the Anglican Church in Southeast Asia, gave his no holds-barred address.